Not long ago Daniele Liverani released the beta version of a new game called ' GENIUS - Into the Toy Warehouses ' for the Apple II. Apparently this first part in the trilogy was inspired by the Genius Rock Opera, which he created way back in the early 2000's. Yet fast forward to the end of 2016 and Hokuto Force has released the trainered C64 version, which not only makes it much easier to play but there's over 80 levels of enjoyment to last you through into 2017. 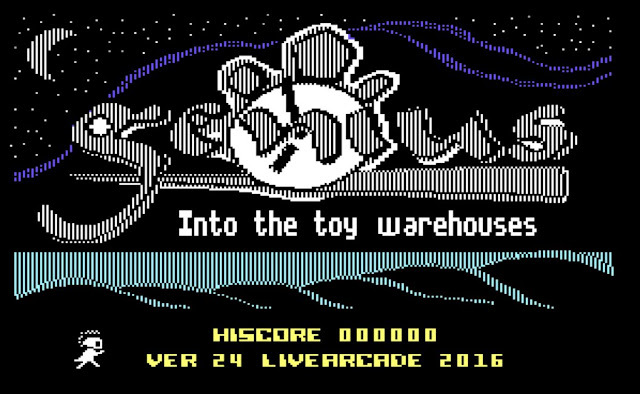 Just as in the Apple II version you once again play as Genius, and you on a quest to free the toys that have been trapped away. The only way to do this however, is to collect the keys, open the correct white lit doors and the toys are yours, but if only it was that simple... 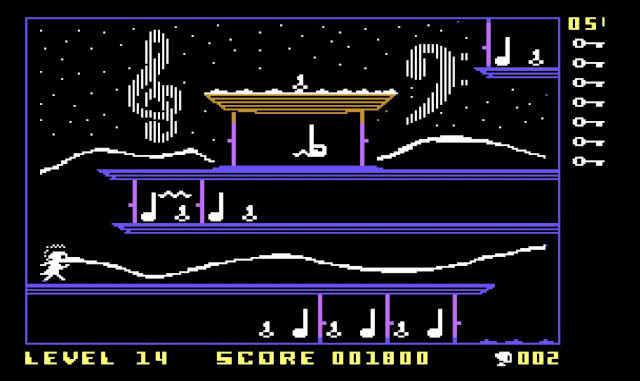 The problem is with this game isn't the fact it looks odd that your character can float about nor is it the highly repetitive music, but the controls are not responding as they should in vice. Thanks goes out to Hokuto Force for giving us a chance to play this game, they rock!